Memorial Day is usually quiet around here; no one is back yet from their holidays. I think there have only been a couple of riders on this side; more on the other side, but not anything like the usual weekend. No real news, so how about a pretty picture? Another daylily, say? 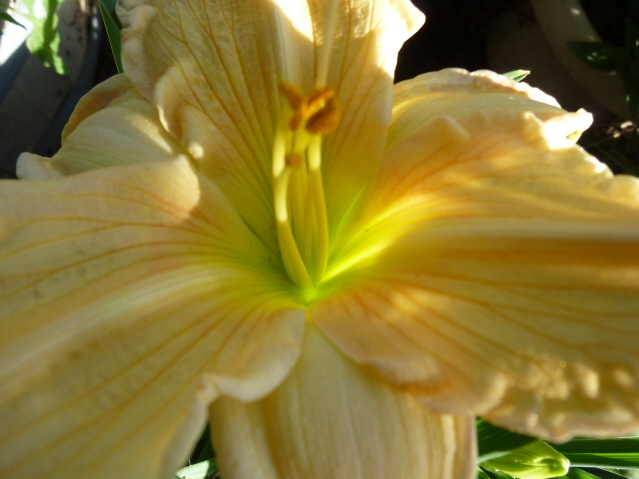 Marion and I are planning to go over to Arroyo Grande on Friday, to a daylily farm there. I would like to have some of the really fancy ones. 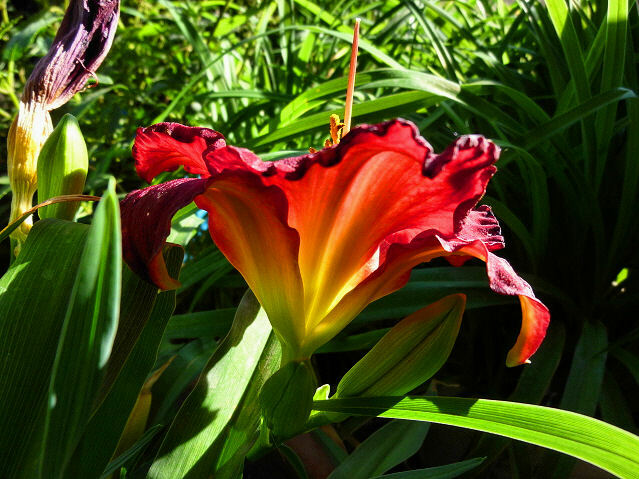 Daylilies seem to like Bakersfield, but it’ll still be quite a shock for a coastal plant. I’ll have to pamper it. It’s been a much better day today. In fact, it’s very quiet. It’s the Memorial Day holiday, so many of our boarders are out of town. A lot of people (including son David) go to Mule Days at Bishop this weekend. I’ll bet that Bishop makes most of its income over the holiday; Mule Days is (are?) a Big Deal. 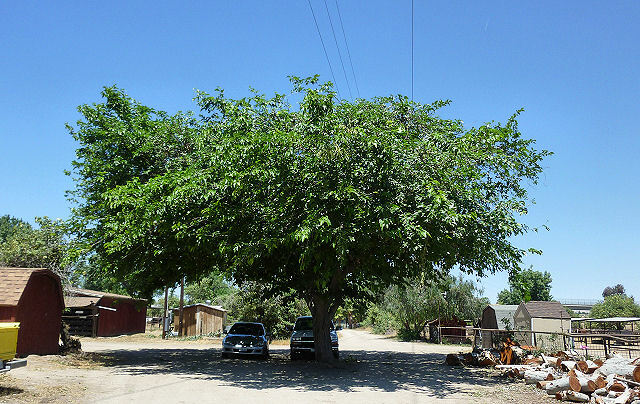 I took a picture of our big mulberry tree after its haircut. As you can see, it doesn’t look . . . natural. People can still park in its shade, though, and it will look better soon. It’s been through this before. 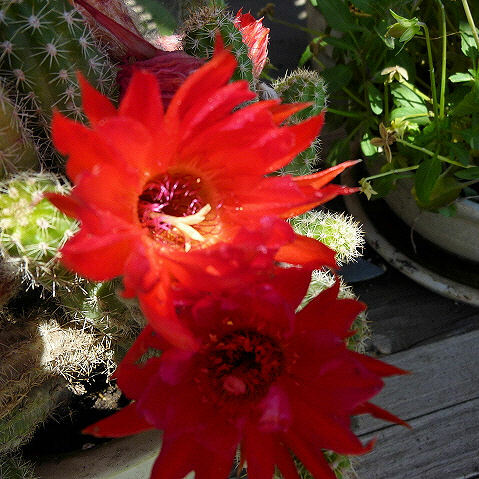 The little cactus on the patio is blooming. It surely produces a lot of brilliant blooms for its size. The red is so bright that it dazzles the camera; it can never capture much petal detail. We’re hoping the quiet weekend continues! I didn’t blog yesterday; it was a trying day. First, Andrew’s puppy Louis was run over and killed. He ran under the wheels of the hay trailer as they were feeding. Andrew is broken hearted, of course. Louis was a very lovable pup. Then Andrew’s sister Sarah took home her pup Spanky, as planned. 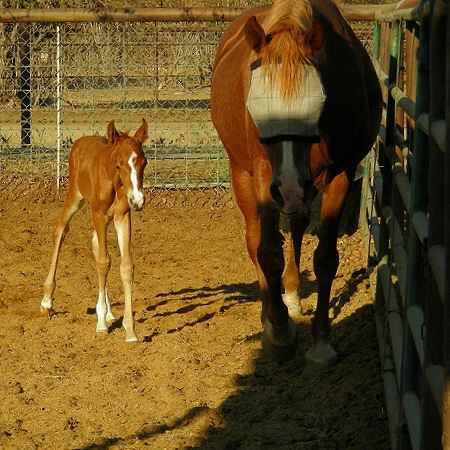 It’s pretty lonesome around here without either little guy. Then, later in the day, I noticed a seedy-looking individual bicycling past the house. Cider barked at him, but I called her back. Mistake. He went on around to Andrew’s, and talked with him for a minute or two, then went on. Andrew didn’t like the look of him either, and followed him. He found him down at the shop, loading up on our tools. (How he expected to get away with them on a bicycle is beyond me.) Andrew yelled at him that he was going to get his shotgun, and the guy dropped the tools and took off on his bike. Andrew followed, and when the culprit went into a house only a few blocks away, he called the police. He said a highway patrolman showed up first, and while they waited for the sheriff, he called me. I went and found Billy, and he drove up to see what was happening. The man came out eventually and took off on his bike, and the sheriff nabbed him and took him away. He was out on probation — of course. He’s likely to be up the river for a while, especially since he appeared to be on drugs as well. We all know it won’t be very long, though. We were glad our grandson was smart enough not to tackle the situation on his own. A few tools aren’t worth getting hurt over, so he handled it just right. It’s happened before, and it’ll happen again; but it came out all right this time. Between one thing and another, I didn’t have much time for blogging. But I did take a couple of flower pictures. Here’s one I really liked. The mockingbirds are singing again. And singing. And singing. And singing. 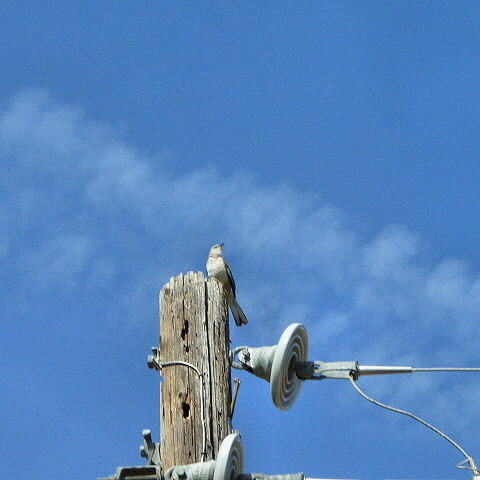 This one perches on top of the power pole by the pump and sings all day long. This we could understand, but then he sings all night long, too. How does he do it? You’d think his little birdy voice would give out. It’s not that it isn’t a very nice song — it certainly is. But after a while, it’s like one of those tunes that gets stuck in your head and you hear all day whether you want to or not. Oh, hark; he’s moved to the roof. And he’s still singing. Let’s hope he finds a girl mockingbird very, very, soon.
. . . to take good horse pictures. I was trying to get a shot of little Jackson’s pretty head . . . but he was fascinated by the camera and kept trying to examine it. As a result, he looks like a deformed hippopotamus. He’s really quite a handsome little fellow. This second shot is better, but his head still looks a little big. 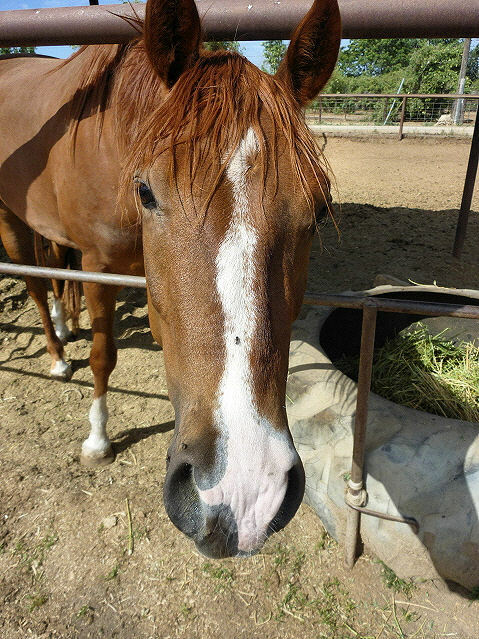 The camera really distorts horses, so unless you have someone or something to distract your subject, it’s really hard to get a good shot. I’ve said this before, but when a picture comes out like that first one, you realize it all over again. The best shots I have of Jackson are his baby pictures. And he was a tiny little baby. He got his feet trimmed yesterday, (and he was amazingly good) which reminded me it’s been three years since he was this fragile spidery baby. Time really does fly . 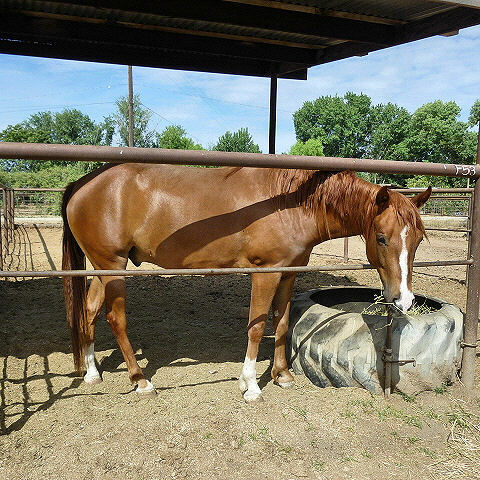 . .
Billy bought a saddle a few days ago. He hasn’t ridden in at least ten years, but he couldn’t resist. And after all, (as he says) it doesn’t eat. An old customer came in with it, and it was a nice one. It was made by Dale Chavez. 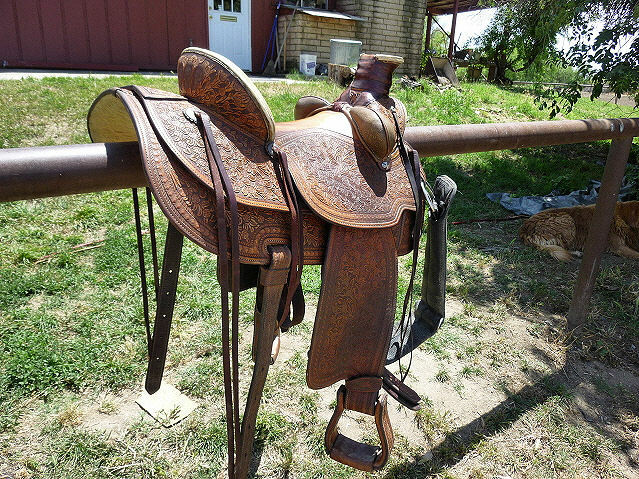 If you go to his website, you will find lots of silver-loaded saddles, but this is a working saddle; and it’s been well used. We don’t consider either one a liability. This is a good saddle. 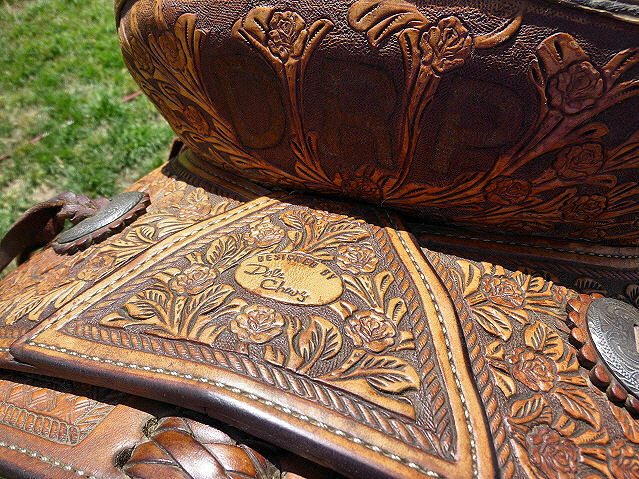 The first owner’s initials are on the cantle. It’s true that the last thing a cowboy wants to sell is his saddle. It must have given him a wrench to part with it. The tooling is interesting. 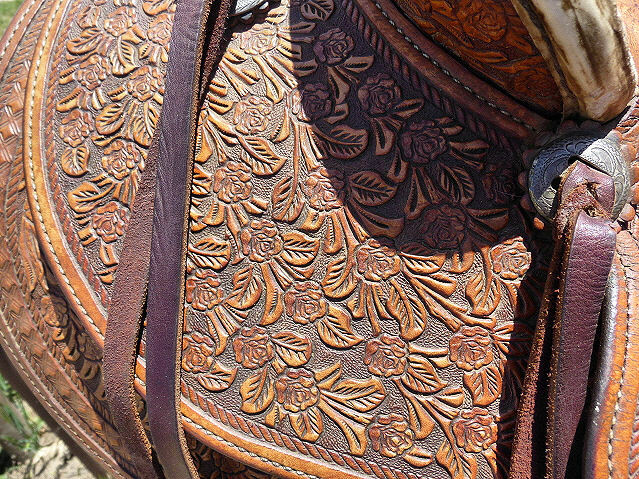 I would bet the roses were stamped first; then the leaf design was carved around them. It’s a buckaroo-style saddle. The tall horn is wrapped to protect it from the rope as it’s dallied (wrapped) around it. This is the style of roping practiced in California and the mountain states. In Texas, the rope is tied “hard and fast” around the horn. Both have their problems. Many dally-style ropers are missing a thumb, wrenched off as it got fouled in the lariat. A hard and fast roper, though, can’t turn loose of whatever he caught if something goes drastically wrong. The Californians used to rope grizzlies; they wanted to be able to turn loose! It has bucking rolls to help the cowboy stay in the saddle if things got Western. 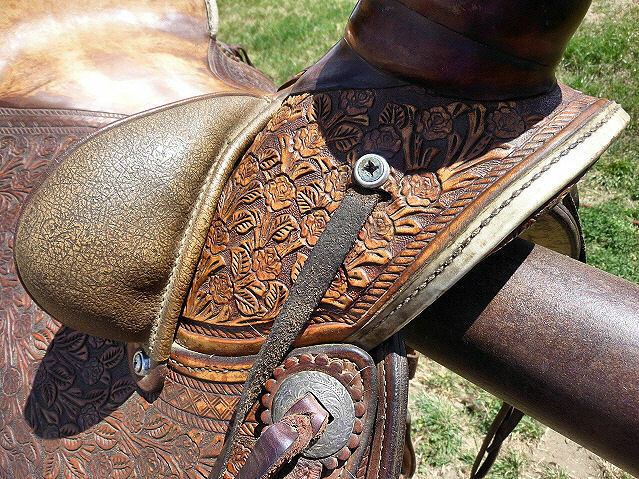 It has rawhide stitched to the cantle and fork to protect them from abrasion. Rawhide is tough. It was a good buy. And if it gives Billy pleasure (as it has) I hope he buys five or six of them! There was a pigeon perched on the arena rail a couple of days ago, waiting for handouts. At least, that’s what it looked like in the morning light. That would have been very bad news; I’ve always sworn that if I started attracting pigeons, I’d quit scattering seed for the doves. Pigeons we don’t need. However, with a closer look, I could see it was not a pigeon at all. It was a dove; larger, paler, and plumper than the mourning doves, but a definite dove. Here it is. 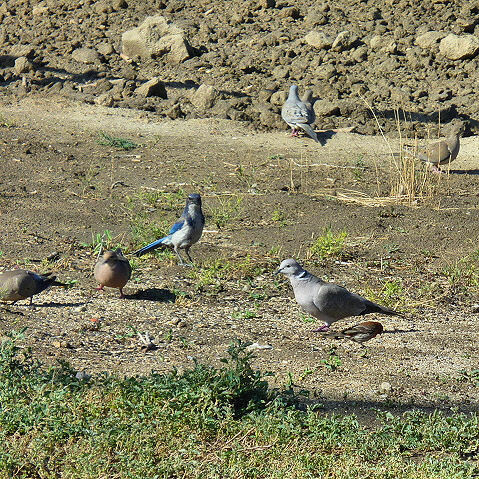 The mourning doves (and the usual scrub jay) are on the left. The intruder is on the right. He turned out to be a collared dove, from either Africa or Eurasia. (Apparenty even the experts can’t tell.) See the little black and white collar on the back of his neck? He’s definitely not a native, but not likely to be a persistent pest like the pigeons. It’s hard to reproduce if there’s only one of you. Oh, wait — isn’t that another one in the background?